In response to sluggish ad sales through BlogAds, we did a thorough SWOT analysis of the situation, hiring innumerable consultants and people with impressive titles. What we found through this research is that Long or Short Capital advertising is a Giffen Good. Upon the recommendation of our consultants, we increased the price of all our BlogAds to double their existing levels. We needed to communicate that advertising on our site was a good value, and the best way was to increase the price of the ads. This dovetailed nicely with an integral life lesson that my father taught me as a young child: if something costs a lot, it must be better than something which costs less. (Why is this the best bike? Because it was the most expensive one son, that’s all you need to know). By raising the price of advertising, we signalled an increase in quality of our product. And, if we signal it enough, this will eventually become an accepted truth (The Goebbels technique). The evidence is now in and the results are clear. 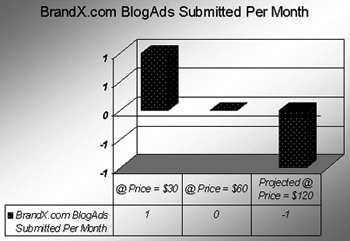 The number of BlogAds purchased in August under Price Regime X was 0. The number of BlogAds purchased in September under Price Regime 2X was 1. 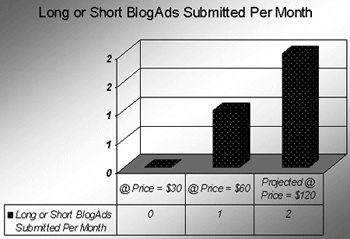 We now project that the number of BlogAds purchased in the next 30 days under Price Regime 4x will be 2. Note the incredible positive elasticity of demand (+1). Below is the actual demand schedule for the number of 1 month BlogAds which were submitted to us vs a leading competitor. Long or Short Capital — 1 out of 1 leading analysts agree that our advertising beats BrandX.com’s advertising in getting out even the toughest household stains in having a positive elasticity of demand. I think Anthony White artwork (www.anthonywhite.net)is a Giffen Good. His sales don’t slow down as the price goes up. It’s possible, but his lower priced items also have strong demand. The result is probably some sort of abberational inverted sideways bell demand curve.